The first total eclipse we saw was on February 26, 1998, in Curaçao. It was so captivating, we started looking for an eclipse closer to home and found there wouldn't be one for 19 years! In early 2014, we starting planning for this one and thought we were ahead of the curve. Our first choice was to try Madras, Oregon. It's close to the centerline, with totality just over two minutes, and among the best weather prospects of anywhere in the US. The most appealing hotel was already sold out, 3 1/2 years in advance. 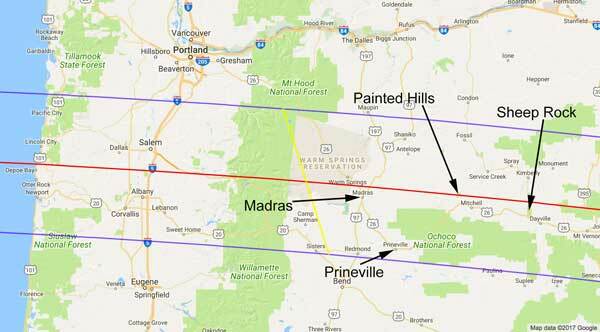 We made reservations at the Stafford Inn in Prineville, not so close to the centerline, but still inside the band of totality, with a duration just over a minute, and within easy driving distance of several sites close to the centerline. and several points of interest in eastern Oregon. In August, 2016, we traveled to Prineville to scout locations. 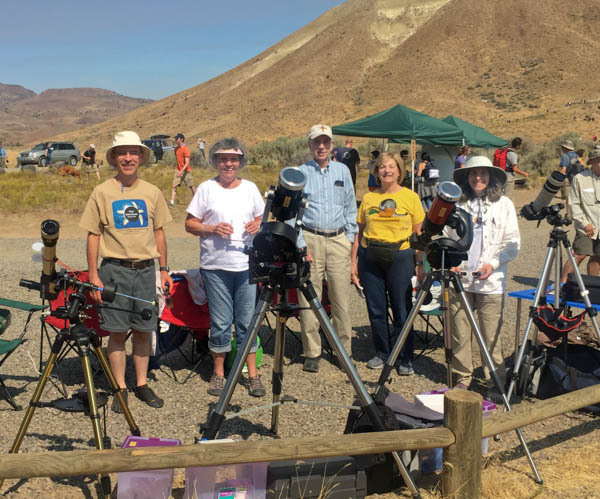 Based on our research, we wanted to view the eclipse from the John Day Fossil Beds National Monument, either the Painted Hills Unit or Thomas Condon Paleontology Center at the Sheep Rock Unit. We scouted both. The Thomas Condon Paleontology Center at Sheep Rock has a wonderful museum explaining the history of the region as told by discoveries found in the fossil beds. This dry scrub brush area was once a rainforest teeming with life. It's a great place to visit, with a generous parking lot for the museum, but clearly not large enough for hordes of eclipse chasers. When we asked about plans for the eclipse, the museum staff said they were working on plans and recommended we watch their web site for more information. Painted Ridge, as seen from Painted Hills Overlook. 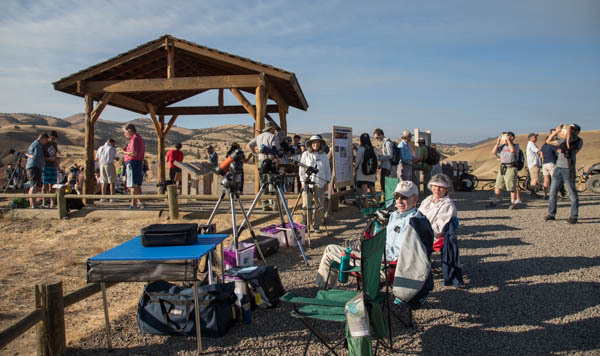 Painted Hills features other-worldly scenery and is right on the centerline, so a perfect spot to view the eclipse. It has even less parking, but seemingly more open space to accommodate a crowd. We watched the John Day Fossil Beds web site during the six months leading up to the eclipse. There was no new information until about a week before when it got updated to say they would have special parking areas for eclipse viewers. For the eclipse trip, we headed to Oregon on Saturday, August 19th, with Cathy's parents and Tom's mom in the Joyces' CR-V and a rented van crammed with telescopes and enough food to survive the predicted eclipse-apocalypse. Our plan was basically a camping trip with hotel rooms. 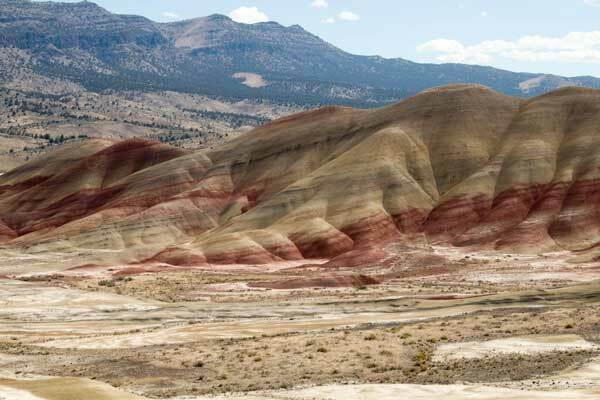 Scouting Sheep Rock and Painted Hills on Sunday gave us more information about the park's plans, including the expanded parking at both sites. We made the decision to try to get into Painted Hills for the eclipse. 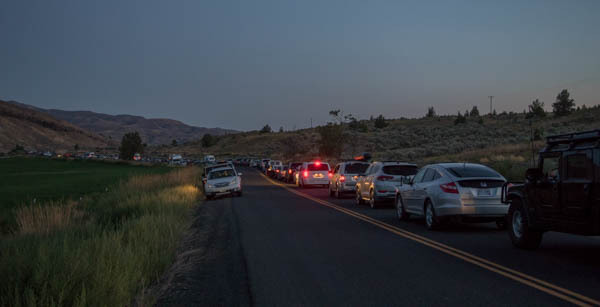 The morning of the eclipse, we left the hotel at 4:30 a.m. We were alone on the road for the first half of the drive to Painted Hills, then found the line of traffic and joined the caravan. At every turn of the twisty mountain road, we expected to find a backup of vehicles lined up to get into the park. Amazingly, traffic flowed nicely all the way to Painted Hills, stopping just 0.8 miles from the park entrance at around 5:40. Someone walking the road told us we were number 349 in line. 5:40 a.m. August 21, 2017. They opened the gate around 6:00 and we headed in and up to a great spot next to the rangers at the head of the Painted Hills Overlook Trail. By 8:15 we had the telescopes set up and ready to observe. Our viewing spot with the telescopes set up. We watched the partial phase, took some photos, shared the view through the telescopes with the rangers and other umbraphiles. As the sun rose in the sky, the moon moved in front of it, first appearing as a small nibble in the upper right of the sun's disk. 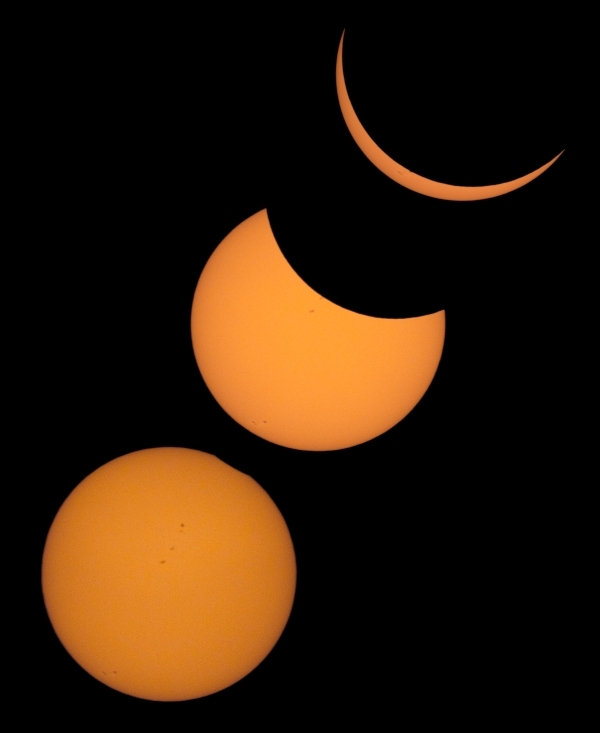 Several images from the partial eclipse before totality. two images show the eclipse deepening as the sun rose higher. Our setup included a hydrogen-alpha telescope, which filters out all but one frequency of red light emitted by hydrogen in the sun's chromosphere. That makes it possible to see more structure in the sun's surface, a nice complement to what we could see with a standard solar filter. Through this telescope, we could see prominences around the perimeter of the sun, which are otherwise only visible during a total eclipse. 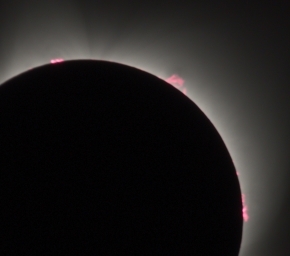 We saw plenty of prominences, a nice preview of what we would see during totality. Prominences and faint inner corona • 1/1000 at f/13, ISO 800. Once the moon has completely covered the surface of the sun, solar filters are no longer needed and we can observe the eclipsed sun directly. Our eyes can see a broad range of light levels that cameras cannot capture in a single photo. The above photo used a short exposure to capture the bright prominences and inner corona. The photo below used a longer exposure to capture the much lighter and wispy outer corona. As you can see in the second photo, the longer exposure washes out the prominences and detail of the inner corona. Outer corona • 1/8 at f/5.6, ISO 400. We believe the faint dot near the lower left corner is Regulus. Cathy combined 13 of her photos to make a composite that shows everything from the prominences to the outer corona. It's beautiful, but even this doesn't capture the dynamic range our eyes see when viewing the real thing. Totality is a spectacular sight that simply can't be reproduced effectively in photos. Totality • HDR composite of 13 photos. Cathy took two multi-exposure bursts of photos during totality. When processing them, she noticed the prominences grew from the first set to the second. Prominences change on a short time frame – through the hydrogen-alpha telescope we would notice differences over an hour, even over 10 minutes – but these photos were only one minute apart. 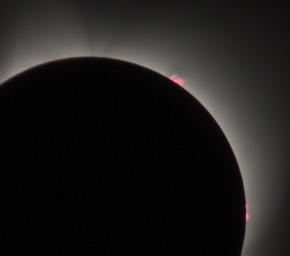 After some examination and discussion, we realized it was the moon moving to reveal more of the prominences. 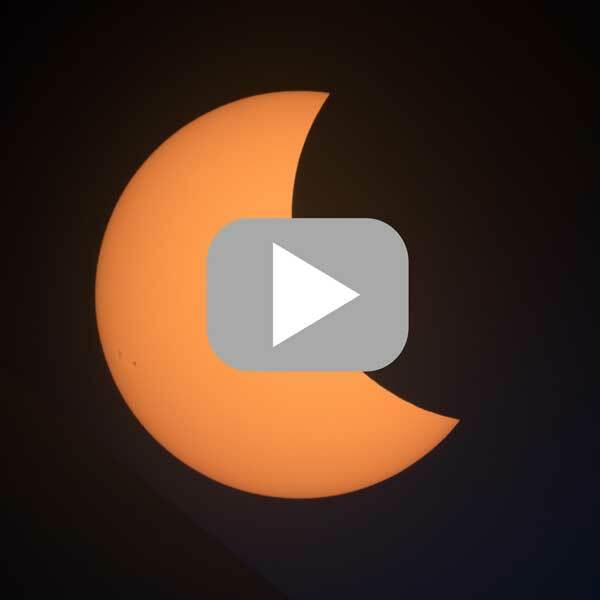 The animation below uses those two images to demonstrate the motion of the moon across the sun during totality. Animation showing the moon's motion during sixty seconds of totality. Totality begins and ends with a pair of spectacles. Near the end of the partial phase, as the moon covers the thin crescent sun, the last we see of sun's disk are pinpoints shining through valleys on the edge of the moon's surface. These are known as Baily's beads. 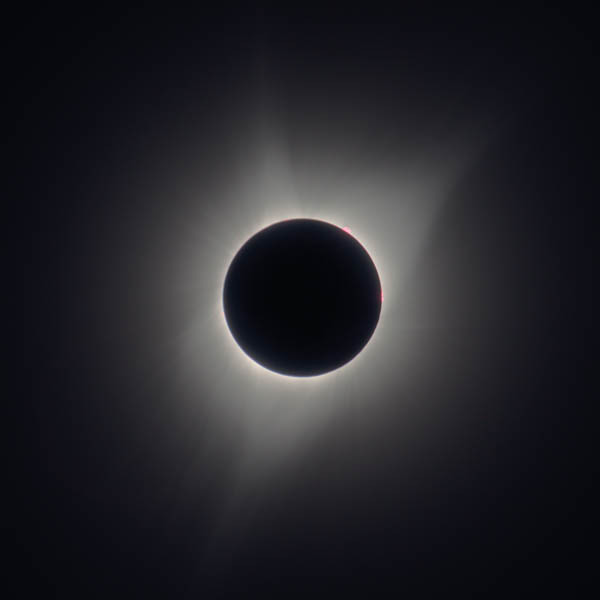 As they disappear before the advancing moon, a final bright beam of sunlight shines through and the sky gets dark enough for the inner corona to become visible as a ring around the eclipsing moon. This effect is called the diamond ring. 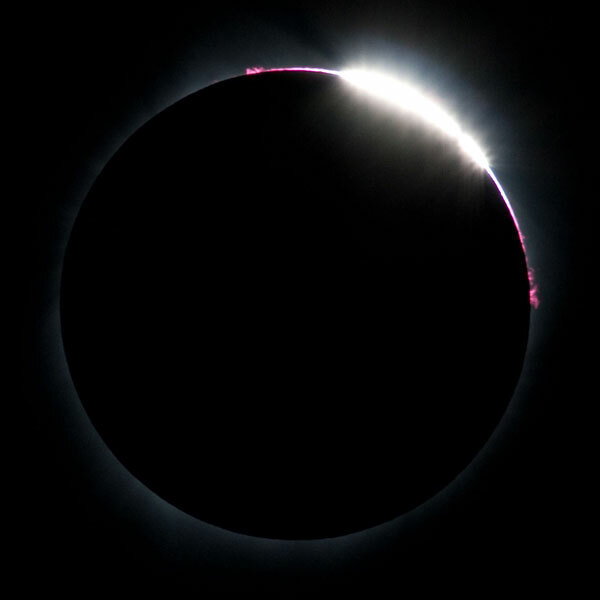 Seeing the diamond ring at the onset of totality is challenging because it happens in the few seconds between when the sun is too bright to look at without a filter and totality has begun. 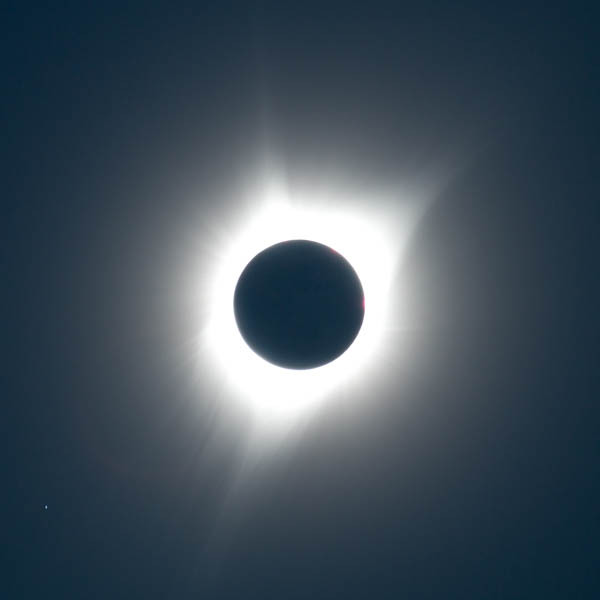 However, the same thing happens in reverse at the end of totality: the second diamond ring appears, followed by Baily's beads as the sun emerges and once again becomes too bright to observe without a filter. 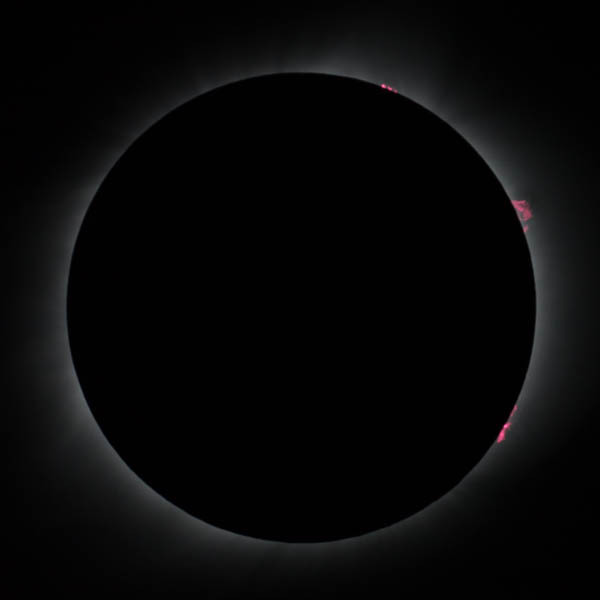 Cathy captured Baily's beads at the end of totality as the inner corona was just barely visible around the exiting moon. Baily's beads • 1/2000 at f/8, ISO 200. The animation below shows the progression from start to finish with totality in the middle. The relative times are exactly backwards: the partial phases before and after totality were slow, about 70 minutes each, while totality lasted just two startlingly short minutes. Eclipse animation. Click to play. Our merry band of eclipse chasers. Tom Saxton, Laura Wall, Jim Joyce, Barbara Joyce and Cathy Saxton. Our eclipse photos were taken from the head of the Overlook Trail at the Painted Hills Unit of the John Day Fossil Beds National Monument. Cathy used a Canon 70D camera with a Canon Zoom Lens EF 100-400mm f/4.5-5.6. Tom used a Canon 6D Mark II camera through a 4" Celestron NexStar 4SE 1325mm f/13 telescope. We also had a 4" Meade 2045 telescope and a Meade Coronado PST Hydrogen Alpha telescope for viewing. The Coronado has an integrated hydrogen-alpha filter that makes it safe to view the sun during the partial phases (and other times), but not so useful during totality. We used appropriate solar filters on the other telescopes and camera lenses during the partial phases.